Do you use oDesk or Craiglist? There is a scam going around on their website and we need to warn you as people are getting fake job invites in our company’s name. DO NOT fall for it if you get a response to your application with instructions to create a Yahoo! Messenger account and initiate an online chat with someone claiming to work for our company. Note that we ALWAYS publish open positions in our website first, before initiating any hiring process. 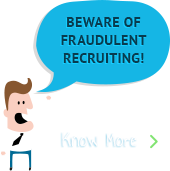 So, in order to avoid any fraudulent recruitment / hiring made in our name, please make sure you go through our Careers page. Remember, that all our official emails will be sent from an email address having “insync.co.in” domain name only. Do not trust an E-mail having any other domain name representing InSync. In case you receive any fraudulent email / call in the name of InSync offering a job that has not been listed in our careers page or if you have any confusion regarding our job openings, feel free to email us at jobs@insync.co.in. [blockquote]“I just made a oDesk account a week or two ago and received a job invite this morning. I have made an account on here to tell those who are looking for data entryjobs on ODesk to be aware of what happened to me. If you are regularly using these sites like oDesk or Craigslist, please be alert for this scam and don’t forget to report the person doing it and also please pass along this information in your network. Also, read our notice here.